Goodreads says, "Some people stay all summer long on the idyllic island of Belle Isle, North Carolina. Others come only for the weekends-and the mix between the regulars and “the weekenders” can sometimes make the sparks fly. Riley Griggs has a season of good times with friends and family ahead of her on Belle Isle when things take an unexpected turn. While waiting for her husband to arrive on the ferry one Friday afternoon, Riley is confronted by a process server who thrusts papers into her hand. And her husband is nowhere to be found. So she turns to her island friends for help and support, but it turns out that each of them has their own secrets, and the clock is ticking as the mystery deepens...in a murderous way. Cocktail parties aside, Riley must find a way to investigate the secrets of Belle Island, the husband she might not really know, and the summer that could change everything.Told with Mary Kay Andrews’ trademark blend of humor and warmth, and with characters and a setting that you can’t help but fall for, The Weekenders is the perfect summer escape." Belle Isle, North Carolina is home to Riley Griggs's vacation house. She is looking forward to getting away from it all as things haven't been that great. Her husband, Wendell, is going to meet her and her daughter, Maggy, on the ferry and this weekend they will tell Maggy that they are going to be getting a divorce. Things haven't been good for years and Riley knows it's time to part ways. But while on the ferry, Riley is served divorce papers and Wendell is no where to be found. To make matters worse, once Riley and Maggy get to their vacation home and it's padlocked shut. A sign says it's in foreclosure, which is news to Riley. Unfortunately, Riley and Maggy have to stay over Riley's mother's house, which isn't the ideal as they don't get along. Then Belle Isle's residents are shocked over a murder that takes place on their idyllic island. 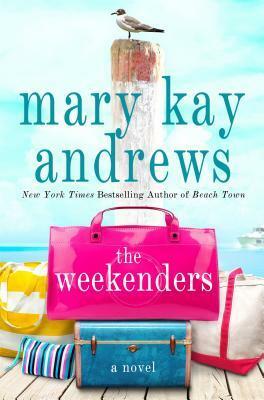 Mary Kay Andrews' beach read, The Weekenders, is perfect for vacation or a pool day. There's romance, betrayal, humor, and even a murder mystery. I felt for Riley in The Weekenders. She was completely blindsided by her husband's actions. There's obviously many secrets that he is keeping from her and this rocks Riley's world. To top it off, her relationship with her daughter is extremely tense. Maggy is a almost a full-fledged teenager and is starting to act like one. While some may think Riley hovers over Maggy, it's only because Maggy suffers from diabetes and needs to be reminded to take care of herself. In my opinion, Maggy is a tough kid to deal with; some of her actions in The Weekenders drove me nuts. I was pleasantly surprised about the murder mystery in The Weekenders. I think that is what separates this beach read from the traditional fluffy beach reads I've read in the past. I definitely enjoyed Andrews' incorporation of a murder in a seemingly perfect beach side community and that's what kept me flipping the pages. My only issue with this was a few of the character's reactions to the murder; I felt that it was almost glossed over at times. The setting of Belle Isle was everything I had hoped for. The fact that there's no cars, there's always cocktails, there's parties on the beach, the ferry, and of course, curious neighbors all added to my enjoyment of the novel and Andrews' portrayal of a Southern beach community. There is a romance in The Weekenders, especially when it comes to Riley being reunited with someone from her past. While I wasn't necessarily on board with this relationship at first, it definitely grew on me as the story unfolded. So, if you are looking for a beach read that is more than just fluff and has a darker edge to it, check out The Weekenders this summer. Geepers. Did Riley ever get the raw end of the deal! Thankfully, there's romance on the horizon for her. But I sure hope it's incorporated in the novel that it doesn't seem forced. I get annoyed with beach reads like that. Sometimes it's unnecessary. I don't know. Lol. I'm definitely curious, though! I hear you. I hate that about beach reads as well, but this romance didn't bother me too much. The murder mystery was an unexpected surprise! Thanks for visiting, Joy! I felt really bad for Riley too. Maggy certainly didn't make things easier for her! I liked the characters and the island and the addition of the mystery but I was disappointed by how the killer was revealed and that part of the story resolved. It felt like the book built up to something more but didn't really deliver. Yes, I hear you on that one. I was pleasantly surprised by the murder mystery, but it wasn't done as well as some others that I have read. I liked that it was an edgier beach read in that sense...glad you enjoyed the book overall as well. Thanks for visiting, Christina! I didn't know this had a murder mystery aspect which definitely makes me more interested. I've enjoyed one or two of her books...but more often than not I find myself struggling to get into her (sometimes way too long) stories. Great review! Yes, it was a pleasant surprise since that's not the norm for my "beach reads." Yes, I have only read a few of her novels, but you have to be in the mood for a fluffy summertime read. Thanks for visiting, Natalie!